ORIGIN() will return the start address of the section and LENGTH() the size of the section, and I can do basic arithmetic too. The linker generated symbols will have an address. This entry was posted in Building, Embedded, gcc, Tips & Tricks and tagged arm gcc, GNU, ld, Linker, software, technology, Tips&Tricks, tool chains by Erich Styger. Bookmark the permalink. Just little nitpick: I guess __m_text_size should not be a pointer but an int or unsigned (?). it really does not matter: it is a linker symbol (from which I can take the address) but the symbol itself has no type or size. So it could be a char, enum, struct or whatever. I usually declare it as a pointer or as a int type. Thank you very much Erich. Got the error something like _user_heap_stack does not fit into m_data : something something overfull by 52 bytes. I’m using a K22FX512 for this, and KDS cannot generate the right linker file because it doesn’t understand that the FX has 128K SRAM in 2 64K segments. I’ve been running all along on a hand modified linker file with no problems til now. So, I figure since I just added a big array, I just have to cut down the size of that by 52 bytes or more. I do so, but no change, still 52 bytes over. I actually went trimming a lot of types of memory, even reducing the size of my FRTOS task stacks, but nothing changed that 52 bytes. I finally went into the linker file and cut the __stack_size from 0x3000 to 0x2F00 and that worked. So the question is what should I be doing and what should I have for the __heap_size and __stack_size ? Will/has NXP fixed KDS so it can generate the linker for the FX512 correctly? if you are not using the standard library malloc(), then you could have a __heap_size of zero too. It is just that some other standard library functions (e.g. printf() with newlib) might use it too. 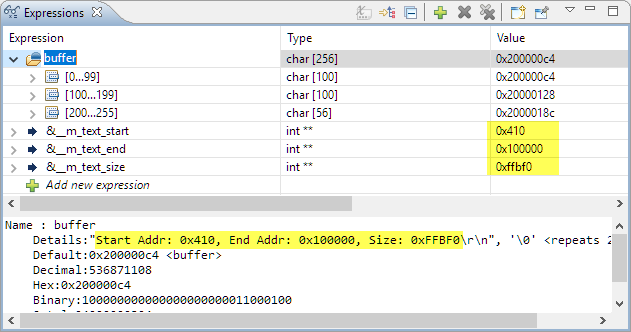 If you are using the FreeRTOS malloc(), then it will use the FreeRTOS heap (unless you are using the FreeRTOS memory scheme 3 which is a wrapper to malloc()/free() of the standard library. The stack size with 0x3000 is very high. You only need some stack during main() until the RTOS is started. I usually have 0x100 there. Depending what you do in main(), this might be even smaller. As for the Processor Expert wrong memory map: I use the workaround described in https://mcuoneclipse.com/2012/03/23/disable-my-code-generation/: I let Processor Expert generate the linker file initially, then turn off linker file generation and have my linker file modified. Another thing that I am not sure if there is a solution to, is that the ‘size’ command doesn’t run when the linker fails, so getting those hints of where the memory got used is not provided. I presume it doesn’t have a file to work from – but it would be nice if it was more clear what memories got used up in the case of a failed link. In case the link phase failed, there is nothing the ‘size’ tool can do, as there is no .elf file, so there is no information about the size. So you will not have any size information. What I do if the link failes (e.g. because not enough RAM or FLASH): I modify the linker file so it has more RAM/FLASH (which is of course only temporary) so it can link. Then I can check the map file what is using too much RAM/FLASH. Any suggestions are welcome! I am struggling with this one! The compiler is correct: your BL_SIZE2 macro is not a constant expression at compile time (it is a substraction of two addresses which are not known at compile time), so it cannot be used that way in your source code. Arrays need to be defined with a constant size known at compile time.